Fort Schuyler was organized in the aftermath of the War of 1812, when it became quite apparent that the United States coastline was poorly defended against foreign invasion. Fort Schuyler was officially dedicated in 1856, before it was even completed. The Fort is strategically located to protect the City of New York City from attack through Long Island Sound, and operated in conjunction with Fort Totten. Fort Totten was located on the northern shoreline of Queens (which faces the Bronx from the other side of the Long Island Sound) and of which is not recorded to have had a locomotive or railway, and therefore is not discussed on this website. Fort's Schuyler & Totten their artillery created a an interlocking field of bombardment against ships attempting to approach New York City. At its peak, Fort Schuyler was equipped with over 400 guns. In later years more modern weapons would be installed in an endless effort to keep coastal defenses up to date. This armament included 10" and 12" guns on disappearing carriages located around the fort. Fort Schuyler also housed served to house Confederate prisoners of war during the Civil War. Fort Schuyler was decommissioned in 1934, and the coastal artillery pieces were removed after 1935. During preliminary research for this location, nothing was known of the Fort Schuyler Railway. The only evidence of Fort Schuyler having a railroad is an entry in the H. K. Porter Locomotive Works builders records, which is reflected below. It is also unknown at this time whether the railway was used in some form of construction at the Fort, used for the transport of general supplies, or the transport of artillery shells & powder; but this last task is the most likely. There have been a lot of people interested in the Fort and the lighthouse at Fort Schuyler, but you're the first one outside of the family, who's been interested in the railroad! Our family (the Ferreira's) were the lighthouse keepers at Fort Schuyler for two generations (1884-1944). My grandfather, Charles Ferreira (1874-1956), worked on the gun battery construction from 1894 until he succeeded his father as keeper in 1910. An older brother also worked on the construction, and later on the Fort Totten batteries as well. 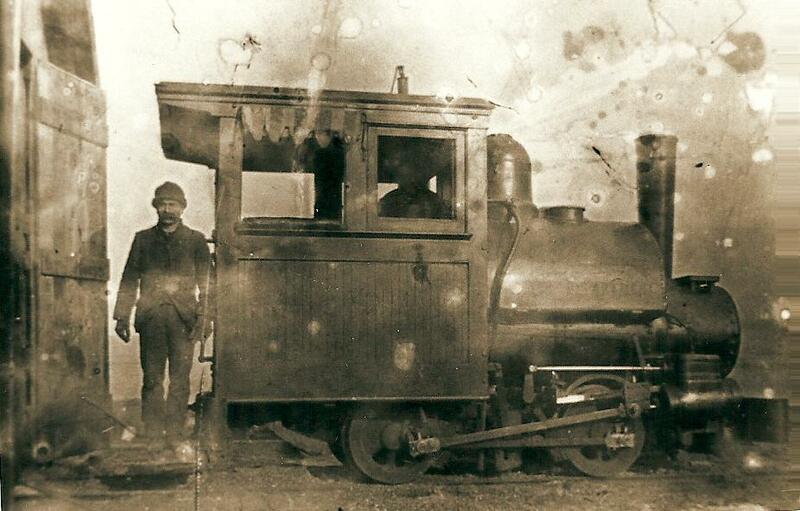 Charles spent a good part of his time on that job as the locomotive engineer on the Fort Schuyler RR. I don't know when the railroad was built, but probably right about the time he started. I also don't know when the railroad was removed, but it was gone before anyone in my mother's generation could remember it. So I would say that it was removed when the battery was completed, before World War I. The enginehouse (doors of it at left in the picture) survived long after the railroad as a storage building for the Fort, with two stubs of rails sticking out under its doors. It was torn down around 1934-1938 during the conversion of the Fort to the Maritime Academy. I don't know what happened to the locomotive, and this is the only picture I have ever seen of it, or any part of the railroad. The picture is a copy made from a glass plate negative that Charles' brother William took. On the original negative, the words "War Dept" can be made out on the saddle tank. I've been looking through my Fort Schuyler maps, but can't find any with the railroad on it. Its route was from the old dock (the present dock is in the same location), around the tip of the Fort and the lighthouse (the lighthouse dwelling has only been in its present location since 1934; before that it was around on the east side of the point). In the old location there were double 3" and 5" gun batteries on either side of the dwelling. The tracks then continued up the east shore past the 12" battery (above and north of the present chapel). The engine house was also in this area. It then went up to the north end of the Fort where the 10" batteries were (present location of the Marine Corps Reserve maintenance area.) As far as I know the major work of the railroad was hauling cement, steel , and other construction materials for the batteries. One note that always goes with this picture is that the man standing by the cab is not Charles Ferreira (though he vaguely resembles him) and that if Charles is in the picture at all, he's in the cab. That's all I know about the railroad, and I don't know if similar ones existed at Fort Slocum and Fort Totten. Check out the roll up "awning" over the engineers window!